Impairment of mesopic vision and night vision adaptation; Increased stresses of visual apparatus, including photostimulation (for protection of the retina from solar, computer and other types of radiation); Decrement in visual acuity, visual fatigue, eyesight strain, eye muscles asthenia; Status after traumas and inflammatory eye diseases for acceleration of healing after eye surgeries; Age-related changes in the eye structure; Windsurfing, skiing, alpinism (vast snow and water surfaces reflect ultraviolet rays almost completely). 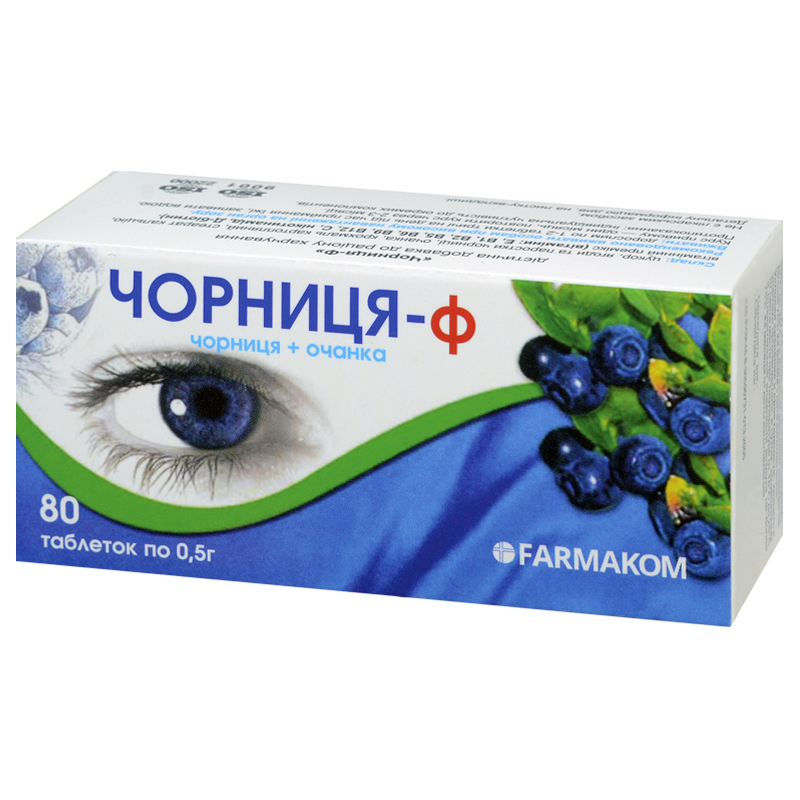 Bilberry berries and springs, euphrasia, vitamin mixture. Bilberry consumption improves blood supply of the retina, thus accelerating retinal tissue regeneration, improvement of mesopic vision, extending field of vision and reducing eye fatigue. Anthocyanins (flavonoids) in bilberry provide positive effect on the retina, preventing wear of this highly sensitive tissue, and stimulate production of rhodopsin, a photolabile pigment of the retina, increasing its sensitivity to changes in light intensity. Under the influence of anthocyanins blood vessels walls are strengthened, their elasticity, as well as cell membranes flexibility are improved, inflammatory process development and clot formation are prevented, metabolism at the tissue level is activated, blood supply to the organ of sight is improved, glaucoma development risk is decreased. Euphrasia contains a complex of active substances – flavonoids, glycosides, anthocyanins, coumarins, iridoids, vitamin C, carotene, saponins, amarines, essential and fatty oils, and microelements: copper, zinc, boron, manganese, magnesium, silver, molybdenum, iron, chromium, nickel. Vast spectrum of microelements affects the reason of inflammatory and degenerative changes of the retina and the vitreous body at the biochemical level. Euphrasia has anti-inflammatory, anti-allergic, astringent (in relation to the mucous membrane of the eyelids and conjunctiva) effects; it also decreases intraocular pressure. Euphrasia is an excellent agent for acuity of vision improving. Complex vitamin mixture (Vit. E, Vit. B1, B2, B5, B6, B9, B12, C, nicotinamide, D-biotin) acts as a catalyst of numerous biochemical processes in the human body; it provides for improvement of immunodefence, decreases aggressive effect of environmental factors. Adult stake 1-2 tablets thrice a day with food, wash down with water. Term of use – 1 month. Repeat in 2-3 months. Individual sensitivity to certain components. Proteins – 0.96 g, carbohydrates – 47.09 g, fats – 0.44 g.